Air King Ventilation: As Advertised Ventilation - Backing Up Those Claims? As Advertised Ventilation - Backing Up Those Claims? You see advertisements all over that make claims about everything from removing stains with one stroke to cars that get 10 times more miles per gallon of gas. Some of them are just downright funny and others leave you scratching your head about the validity of the claim. The ventilation industry is no different. Manufactures are constantly making claims regarding the performance of their products. The two main claims are for air movement – known as cubit feet per minute or CFM and sound levels known as Sones. The question is, how do you know you are getting what you are paying for? Is this just another one of those things where manufacturers make up numbers so they look good? There is hope and it is known as the Home Ventilating Institute or HVI. HVI is an independent third party testing and certification lab that ensures advertised performance numbers are being delivered. HVI maintains a database of models that have been tested and certified in their facility and publishes this list each month on their website (you can view the list here). Products go through stringent testing for airflow, sound, and energy usage. Once a product is certified, it will display the HVI Certified logo on it. It is very simple from there – no logo or not on the list - not certified. You might still have some doubts and a common question that arises is, once tested what is to prevent a manufacturer from changing the product? HVI has that covered. Products can be pulled at anytime and a verification test completed to make sure nothing has changed with the product. If the product fails, it will be removed from the directory until a suitable action plan can be put into place and the product delivers the advertised performance. The next argument that comes up is, who is HVI, I have never heard of them, is this one of those pay-to-play organizations? The short answer is NO. HVI is the leader in ventilation certification and is recognized as the preferred method of performance assurance by the country’s top organizations including; ENERGY STAR®, ASHRAE Standard 62.2, California Title 24, National Association of Home Builders (NAHB), RESNET, US Green Building Council LEED and many more. These organizations depend on HVI to certify and verify that the products meet the performance numbers they have set. Unfortunately there are many manufacturers out there that do not have their products tested and certified. These product usually fall into the “Too Good to be True” category. While we cannot definitively say they are or are not living up to their advertised performance numbers we can say organizations such as ENERGY STAR will not recognize them. The best way to make sure your ventilation products will deliver as advertised is to look for the HVI logo. 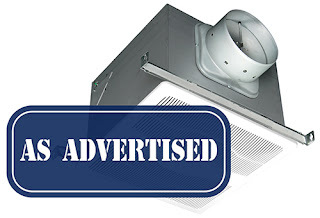 To learn more about Air King’s HVI certified Exhaust Fans and Range Hoods, visit www.airkinglimited.com.